Welsh judoka Natalie Powell says she will not allow herself to get stressed out as she bids to qualify for the Rio Olympic Games. 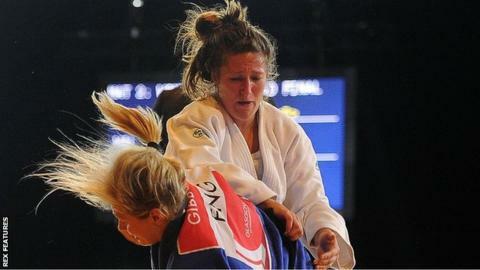 Powell, 25, beat Gemma Gibbons to win 2014 Commonwealth gold in the -78kg class. Gibbons is Powell's main rival for the only Team GB slot available for Rio 2016. "If I perform as well as I can I will be the one going [to Rio] in the end," Powell said. "You can only do your best and I'm taking each competition as it comes. "The qualification period is so stressful. It's constantly on my mind. "I've just got to try and not let it get on top of me, which I think I'm doing at the moment." Powell is currently eighth in the International Judo Federation rankings, with 2012 Olympic silver medallist Gibbons 16th. Powell, raised in mid-Wales, finished fifth at the Havana Grand Prix last weekend, her first competition following a 10-week absence because of a knee injury. "It wasn't what I wanted - everyone wants to be on top of the podium," Powell added. "The first half of the day went really well and I put in some really good performances. "I let myself down a bit in the last fight against a girl I've beaten a few times before, but it was great to be back on the mat. "I was about where I hoped I would be after the injury. I feel so much fresher." Powell is next in action at the Paris Grand Slam on 6-7 February.